Susan Forest is an editor of science fiction, fantasy, and other speculative genres of fiction, and she is a member of the Calgary Association of Freelance Editors. 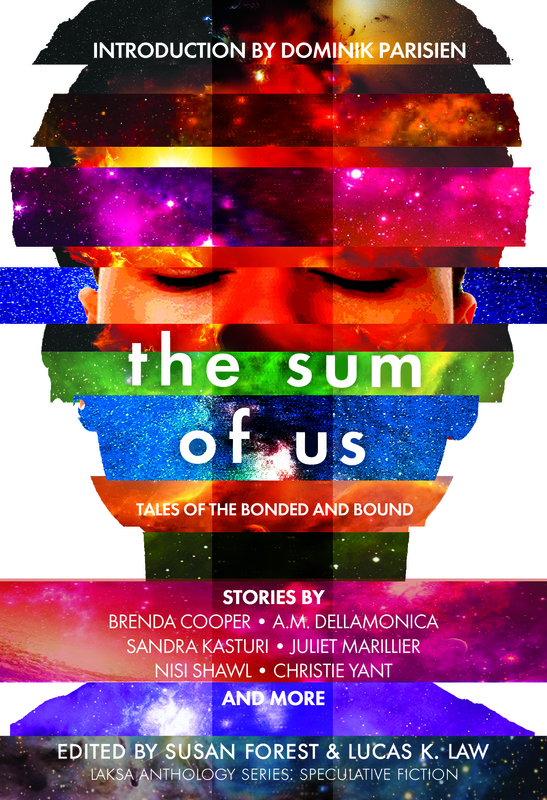 2017: The Sum of Us: Tales of the Bonded and Bound. Twenty-three science fiction and fantasy authors capture the depth and breadth of caring and of giving and delve into the complex world of caregivers. They find insight, joy, devastation, and heroism in grand sweeps and in tiny niches. And, like wasps made of stinging words, there is pain in giving, and in working one’s way through to the light. Our lives and relationships are complex. But in the end, there is hope, and there is love. AUTHORS: Colleen Anderson, Charlotte Ashley, Brenda Cooper, Ian Creasey, A.M. Dellamonica, Bev Geddes, Claire Humphrey, Sandra Kasturi, Tyler Keevil, Juliet Marillier, Matt Moore, Heather Osborne, Nisi Shawl, Alex Shvartsman, Kate Story, Karina Sumner-Smith, Amanda Sun, Hayden Trenholm, James Van Pelt, Liz Westbrook-Trenholm, Edward Willett, Christie Yant, and Caroline M. Joachim, with an introduction by Domink Parisian. 2016: Strangers Among Us: Tales of the Underdogs and Outcasts: Nineteen science fiction and fantasy authors tackle the division between mental health and mental illness; how the interplay between our minds’ quirks and the diverse societies and cultures we live in can set us apart, or must be concealed, or become unlikely strengths. This important anthology featuers work by Kelley Armstrong, Suzanne Church, A.M. Dellamonica, Gemma Files, James Alan Gardner, Bev Geddes, Erika Holt, Tyler Keevil, Rich Larson, Derwin Mak, Mahtab Narsimhan, Sherry Peters, Ursula Pflug, Robert Runté, Lorina Stephens, Amanda Sun, Hayden Trenholm, Edward Willett and A.C. Wise, with an introduction by Julie Czerneda. 2013: The Trillionist, by Sagan Jeffries: Spurred on by a darkness residing within his brilliant mind, Sage Rogan, boy-genius and inventor, is relentlessly driven to bring modern advancements to his people. In fearing for his own sanity, he eventually discovers a part of his mind is, in fact, a shadowy ancient spirit with ulterior motives of its own. Realizing that the inventions he’s been coerced into creating could destroy his world, Sage yearns to make things right; clashing with the powerful entity to save his world from annihilation. 2011: Technicolor Ultramall, by Ryan Oakley: The world’s ecosystems have been destroyed by genetic pollution and cities have evolved into mega malls. Budgie is a knife wielding, brass knuckled young man from the impoverished and brutal red section of Toronto’s T-Dot Center. When his best friend is murdered and Budgie falls in love with the woman responsible, he learns that there’s more to life than drugs, blood or money. To escape his past he must give up everything and everyone he knows and sell his perceptions to an enigmatic and dangerous gang leader. Fighting for survival and unwittingly involved in a scheme that only he can stop, Budgie must ask himself: Does he want to? Technicolor Ultra Mall is an ultra-violent science fiction dystopic novel about the value of being human in a completely commodified world. Susan Forest is a member of the Calgary Association of Freelance Editors (CAFE). Visit her editing webpage for more information.